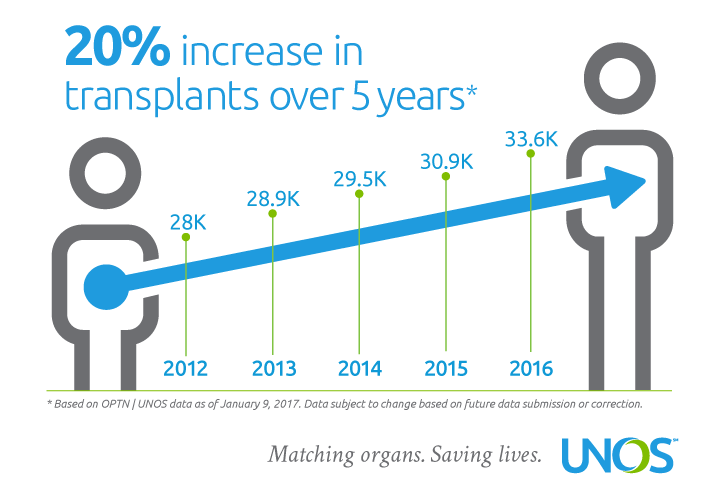 Organ transplants performed in the United States in 2016 reached a new record high for the fourth consecutive year, according to preliminary data from United Network for Organ Sharing (UNOS). UNOS serves as the national Organ Procurement and Transplantation Network (OPTN) under federal contract. For the year, 33,606 transplants were reported, representing an 8.5 percent increase over the 2015 total and an increase of 19.8 percent since 2012. The growth in overall transplants was largely driven by an increase of 9.2 percent in the number of deceased donors from 2015 to 2016, continuing a six-year trend of annual increases. Many deceased donors provide multiple organs for transplantation. Approximately 82 percent (27,628) of the transplants involved organs from deceased donors. The remaining 18 percent (5,978) were performed with organs from living donors. In addition, an increasing number of deceased donors in 2016 had medical characteristics or a medical history that, in prior years, may have been considered less often by clinicians. These include people who donated after circulatory death as opposed to brain death, as well as donors who died of drug intoxication or those identified as having some increased risk for bloodborne disease.